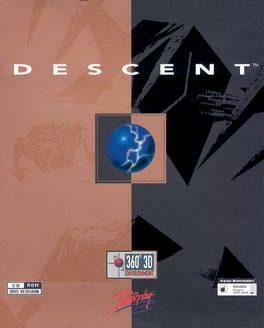 Welcome to Descent - 30 levels of the most mind-bending, stomach-churning action game ever. Featuring true 3-Dimensional worlds with light source shading, texture mapping, 3-D morphing, directional sound effects and sizzling music, this is technology taken to the limit.You begin deep below the surface of Lunar Base I where an unknown alien race has taken over the chasm of the Post-Terran Mining Corporation. Lunge straight down mine shafts, twist around never-ending tunnels and fight your way past robotic menaces in an environment that's truly 360° 3-D... move up, move down, shoot everything everywhere. Hang onto your senses (and your lunch) as you drop straight down mine shafts on a ride that'll leave you spinning.And what's the good of losing your mind if you can't share the experience with your friends? Descent invites you and your buddies to dive into the action together with head-to-head combat and cooperative two-player modem and eight-player network support. Descent is available from 6.99 to 6.99 from 1 shops.